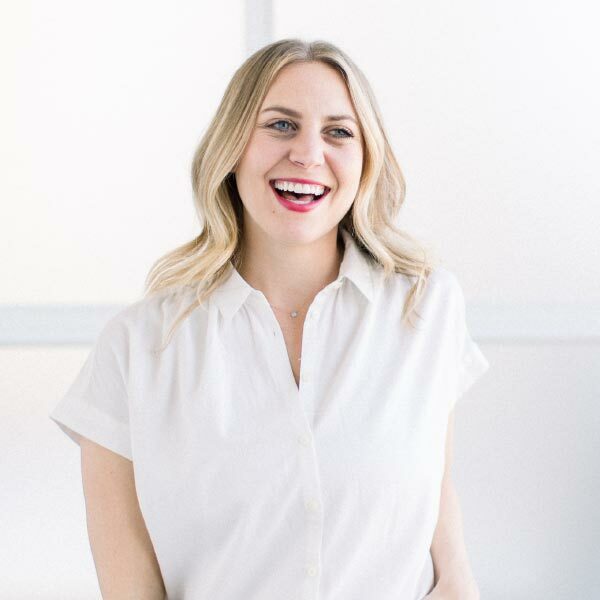 Get a sous vide for Christmas and looking for easy, healthy recipes to make with it? Look no further. 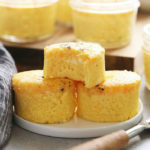 You’re going to absolutely love these Cheesy Sous Vide Egg Bites. They’re made with 3 basic ingredients and done in under 60 minutes. We’re back with another super simple sous vide recipe. 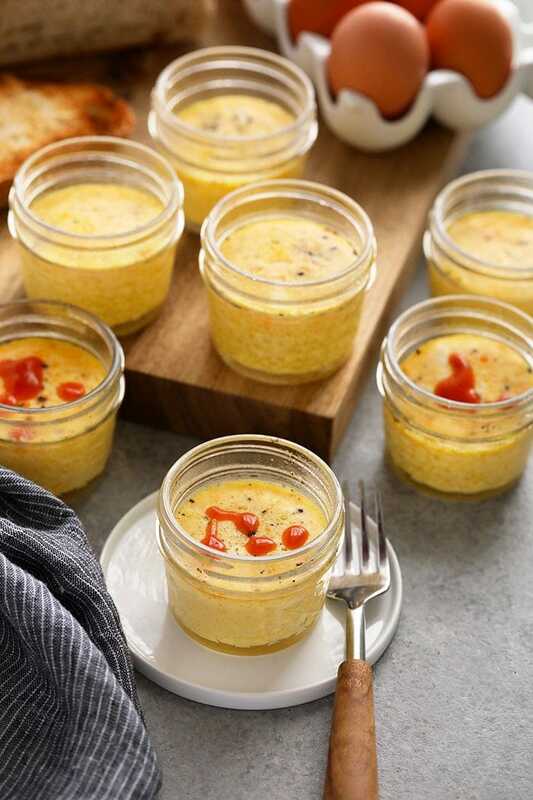 This time, we’re ditching the meat and keeping things vegetarian with a quick and easy sous vide egg bites recipe. 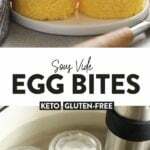 I’m sure you’ve had the famous Starbucks Sous Vide Egg Bites. Well, guess what? You can actually make these in your own kitchen and in no time at all! Sous vide cooking is a method of cooking where you use a regulated water bath to precisely cook food to a certain temperature. Want to cook a steak to medium rare? Good news! If you sous vide the steak, the entire steak will come out medium rare, not just the middle. The great thing about the sous vide is that whatever you are trying to cook, will come out perfectly even. Typically meats and other food such as eggs or vegetables are vacuum-sealed in a plastic bag with the air removed and then submerged into the water bath. In this recipe’s case, we used a Mason Jar as the vessel, which works in the exact same way. If you are looking for the perfect, reasonable sous vide. We HIGHLY recommend the Anova Culinary 800W. It’s Smartphone-friendly and costs $99. 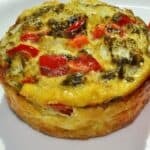 What are Sous Vide Egg Bites? 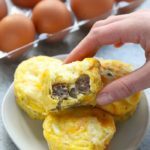 When you cook egg bites in the oven in a muffin tin, usually, they come out a little bit harder on the outside and more perfect in the middle. That’s because whatever touches the muffin tin is going to get hotter, thus cooking more on those parts. When you cook something in the sous vide, it’s submerged in water, which is the same temperature throughout your entire pot, thus cooking whatever is being sous vide perfectly even. 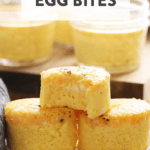 Once you make this Sous Vide Egg Bites recipe, you will totally get what I’m saying. What you’ll need for this recipe is very simple: eggs, milk and shredded cheese. You’ll also need some salt and pepper and if you like hot sauce for serving, we recommend that too! In addition to the ingredients for this recipe, you’ll also need a large stock pot and 6-9 4 oz. Mason Jars. First, attach your sous vide to the edge of your stock pot. Since all stock pots are different sizes, place your Mason Jars inside to see how many will fit when cooking. 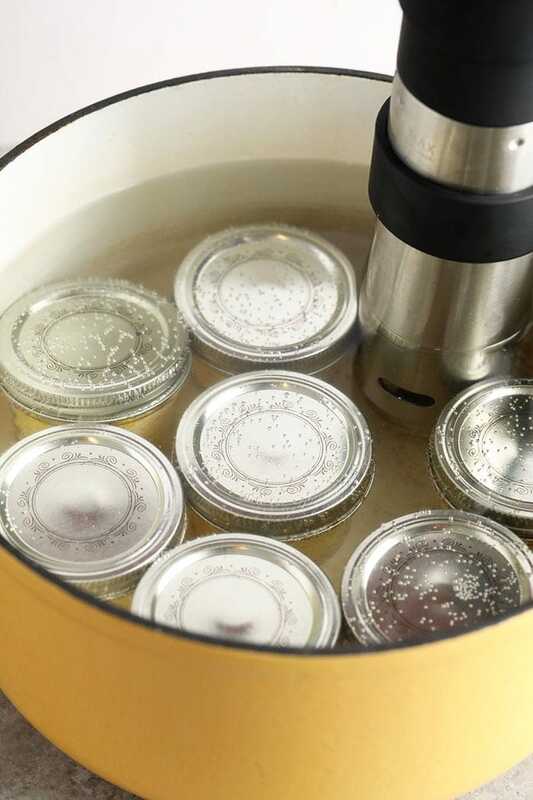 After you’ve gotten your count, remove the Mason Jars and then fill the stock pot up with water about halfway. The goal here is to make sure your Mason Jars will fully submerge in the water, so you’ll want to fill it at least to that height. Set the temperature on your sous vide to 172ºF and press start. Whisk together eggs and milk. 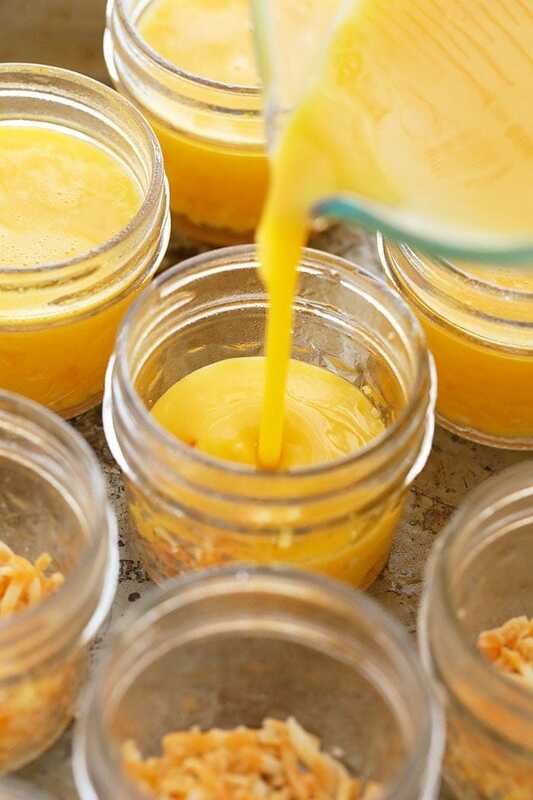 Then, place 1 tablespoon of shredded cheese on the bottom of each Mason Jar. Fill the jar up about 3/4 of the way full with the egg mixture and then season with salt and pepper on top. Do note that if you can fit 9 jars on the bottom of your stock pot, you will have the adjust the number of eggs and milk you use for this recipe. Or sous vide these in 2 batches. 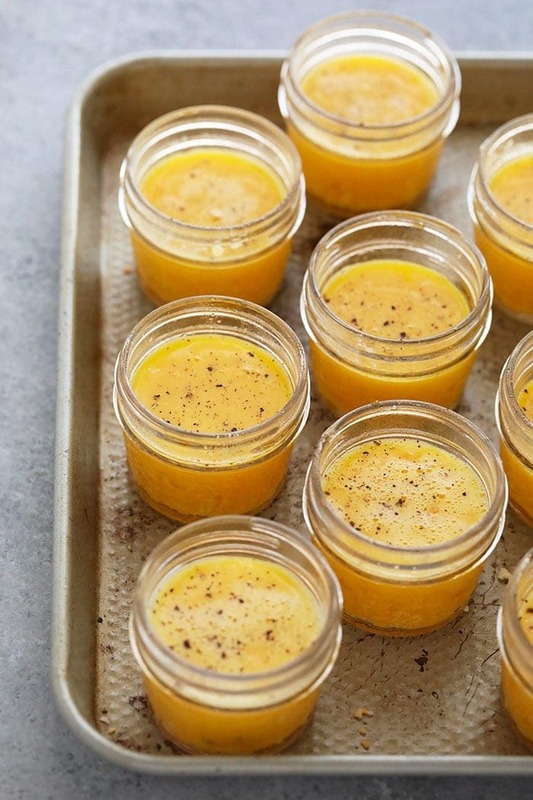 Now that you’ve prepared your Sous Vide Egg Bites, it’s time to screw the tops on. This part is also very important because you don’t want to screw the lids on too tight or you will risk them exploding in the water bath. Screw the tops on and then unscrew one turn. This will ensure the pressure won’t get trapped inside of the jars. Now it’s time to sous vide! 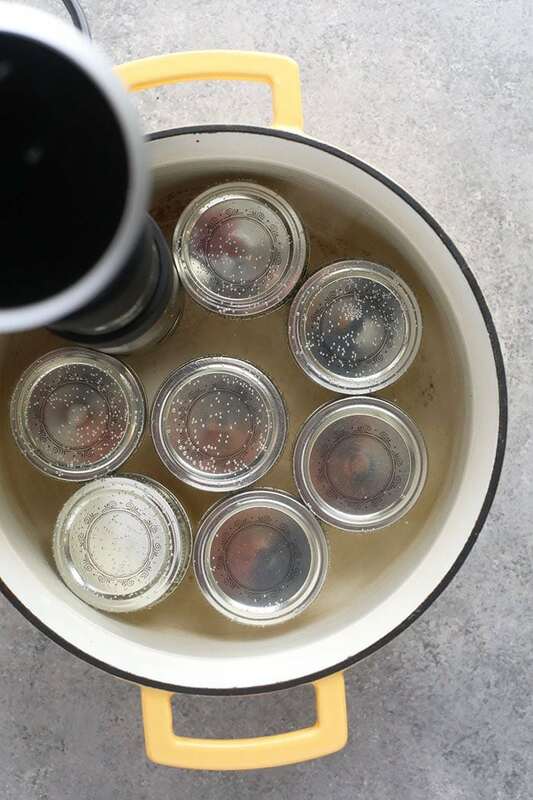 Once the water has heated up to 172ºF, place all of the Mason Jars on the bottom of your stock pot. They should sink right to the bottom and you should see lots of bubbles come to the top IF you unscrewed the tops properly. Set your timer to 1 hour and let your egg cups cook. Use tongs to remove your egg bites from the water bath and let cool for around 10 minutes. Then, use a knife to remove your egg cups from the Mason Jars. 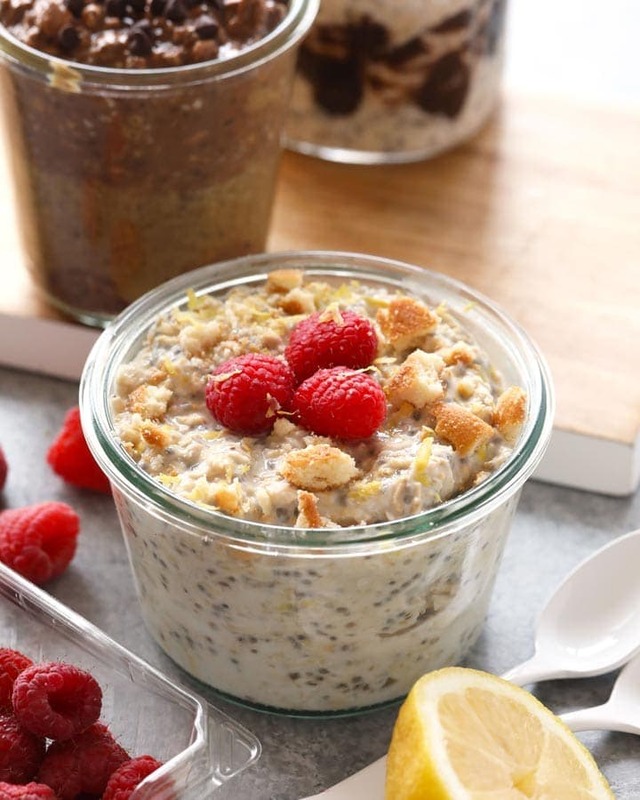 Alternatively, you can throw the jars right into the fridge for an easy grab and go breakfast in the morning still in the Mason Jar! When you’re ready to eat, we recommend serving with some hot sauce. 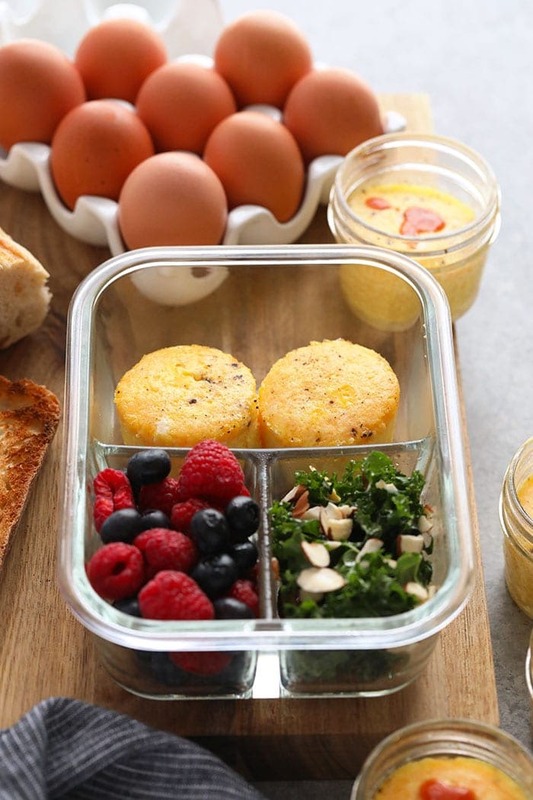 These little egg bites are also perfect for an on-the-go meal-prep breakfast paired with some berries and a breakfast salad. However you choose to eat them, you will not be disappointed! 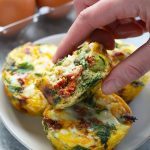 PS: these are also a great low-carb, Keto egg muffins recipe. Get a sous vide for Christmas and looking for easy, healthy recipes to make with it? Look no further. 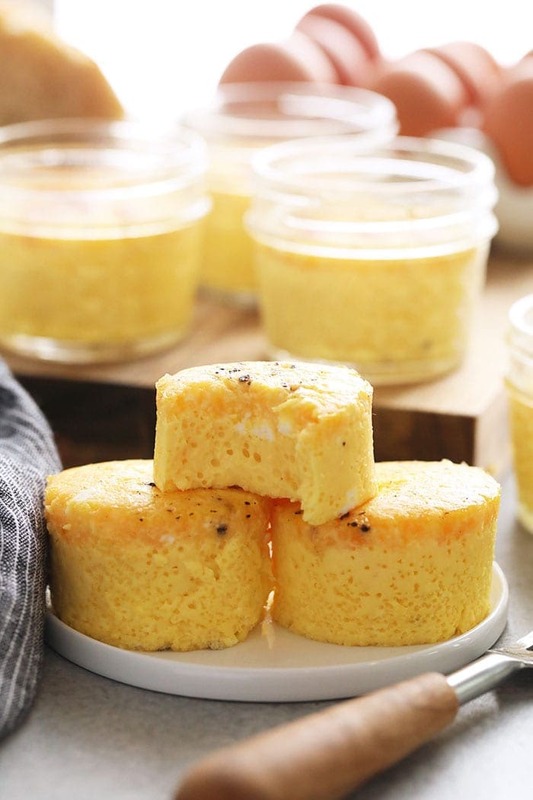 You’re going to absolutely love these Cheesy Sous Vide Egg Bites. 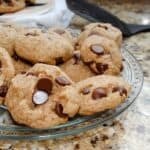 They’re made with 3 basic ingredients and are done in under 60 minutes. First, fill a large stock pot halfway up with water. You’ll want to be able to submerge all of your mason jars with water, so keep that in mind. Next, screw your Sous Vide (HERE is the one we have!) to the side of your pot and turn to 172ºF. 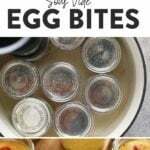 While your water bath is heating up, prepare egg bites. Spray 9 4-oz. mason jars with nonstick cooking spray. Then, spoon about a tablespoon of shredded cheese onto the bottom of each mason jar. Crack 10 eggs inside a medium bowl or pyrex. Add milk and whisk until scrambled. Fill each mason jar up about 3/4 of the way full with the egg mixture. You should get about 9 egg cups. Give each egg cup a little stir and then season the tops with salt and pepper, to taste. Now it’s time to screw on the lids of your mason jars. You want to make sure that you don’t fully tighten your mason jars so that they do not explode in the water bath. Screw on tops and then unscrew one turn. Submerge mason jars inside of water bath. You should see lots of bubbles come to the top. This is good! Set the timer for 1 hour and let cook. Once the timer goes off, remove mason jars and unscrew. 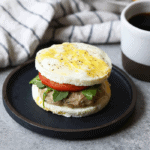 Your egg cups should feel like a souffle. If they’re still runny, you need to cook them longer. If you’re ready to eat, grab a fork! This recipe makes 9 4-oz. egg cups. The amount of egg cups you make depends on the size of your stock pot. So, before you start cracking eggs, see how many mason jars you can fit on the bottom of your pot.